SMRI is proud to support the motorcycling community in New Mexico. We supply the race track track, a routine, corner marshals, and an ambulance with an emergency medical staff so that you may ride with confidence. During a track day you can explore the limits of your machine without putting yourself in danger. The members of the SMRI have seen first hand the results of motorcycle crashes on the Crest, so we offer this service so that you keep the rubber side down. If you have never ridden a track or would like to improve your riding skills we offer a "Street Skills Course" with our road race instructors free of charge. Track days are open to all motorcyclists (first-time track riders and experts). Track day riding requires minimal bike prep, so come out to improve your riding skills in a controlled environment & have a great time doing it. If you don't have leathers, inexpensive rentals are available. You'll need take off your mirrors & license plate, & put tape over your headlight, taillight, & turn signals (or take them off). Make sure that your brake pads and tires are good, & that everything else is in good condition (no leaks, blown fork seals, etc.) You are NOT required to change your coolant for a track day. There are always riders/racers at the track that are more than willing to help you get your bike ready. We have several pages to help you get ready for your Track Day experience with SMRI. See Track Day Schedule to learn about how SMRI structures its track says and when you'll need to do certain things like arrive at the track, see the Registration Team, undergo Technical Inspection, and when you'll be on the track. See Track Day Prep to learn more about what you'll need to do to make sure you have the correct gear and that your motorcycle will breeze through Technical Inspection on the first try. See Track Day Guidelines to learn more about on-track procedures, and other topics related to your safety and the safety of others while on the racetrack. 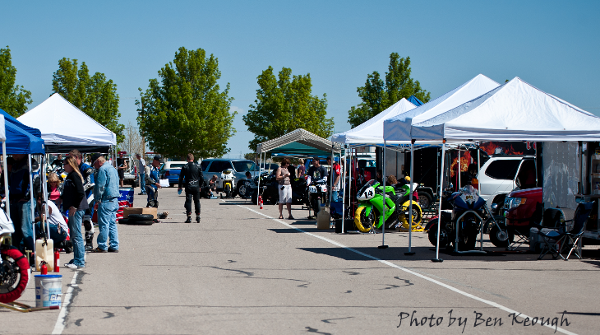 See Track Days - FAQ to see answers to many commonly asked questions about SMRI Track Days. See Track Day Sponsors to learn more about SMRI's Track Day sponsors and how you can support them!